I was cleaning the closet today and about to toss this stained ivory shirt when I had an epiphany. 10 seconds of crafting made it into something Little V can wear to her Valentine's party tomorrow. I dipped heart shaped cookie cutters into red acrylic paint. Stamped them onto the shirt. Hey, I've got to take my thrills where I can get them. Don't forget, the giveaway for this petal knot apron dress is still going on below, but only until Valentine's Day. 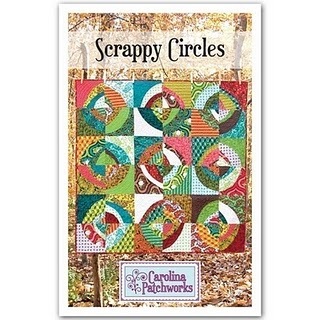 And Brown Paper Packages has a giveaway for this quilt pattern going on. Go see her to enter. I love it. And you should be proud! Cute and clever, my favourite combo! very cute! I might outline a few with rhinestones for my little one! For the pattern giveaway- so adorable. Thanks.